Li, H., Park, H. and Jonas, E. A. (2014). Fluorescent Measurement of Synaptic Activity Using SynaptopHluorin in Isolated Hippocampal Neurons. Bio-protocol 4(23): e1304. DOI: 10.21769/BioProtoc.1304. This protocol comprises the entire process of fluorescent measurement of vesicle recycling using the probe SynaptopHluorin, a pH-dependent GFP variant whose fluorescence increases at the synapse upon vesicle release due to fluorescence quenching in acidic vesicles. This technique provides a genetic tool to monitor synaptic vesicle recycling in real time in cultured hippocampal neurons. Note: pHluorin-based fusion-proteins in which ecliptic pHluorin was fused to an intraluminal loop of synaptotagmin (Fernandez-Alfonso and Ryan, 2006; Wienisch and Klingauf, 2006). Note: No.1 glass coverslips are washed with HCl and ethanol, then autoclaved. Autoclaved glass coverslips are treated in 0.1% (w/v) poly-L-lysine for overnight. poly-L-lysine is aspirated on the next day, and glass coverslips are washed with sterile water three times. Primary rat hippocampal neurons are prepared from rat fetuses (Sprague-Dawley, day 18 of gestation; Harlan, Indianapolis, IN) as described previously (Krueger et al., 2003; Kaech and Banker, 2006; Li et al., 2008a, b; Beaudoin et al., 2012; Park et al., 2014). After isolation of hippocampi from prenatal brains using autoclaved tools, they are incubated for 12 min with 0.03% trypsin. The hippocampal neurons are dissociated by trituration through a sterilized polished Pasteur pipette. The neurons are seeded onto plates containing medium with 5% FBS. After 3 h incubation, cells are maintained in neurobasal medium supplemented with B-27, glutamine, and antibiotics. Neurons are grown at 37 °C in a 5% CO2 and 20% O2 humidified incubator. Neurons are transfected with 2.5 M calcium phosphate at day 5 after plating with an efficiency of 1-5%. Briefly, transfection cocktail solutions are prepared as follows and incubated at room temperature for 20 min: 15 μl H2O, 1.8 μl 2.5 M of CaCl2, 1.5 μg of cDNA, and 15 μl of 2x HeBS (for a well of a 12 well plate with 500 μl media). Cocktail solution is added into the cell culture medium already present in the well and incubated for 30 min. Then this transfection medium is replaced with conditioned media after washing three times. Embryonic hippocampal neurons (E18) are dissected then incubated for 12 min with 0.03% trypsin. The hippocampal cells are dissociated by trituration through a polished Pasteur pipette. Neurons are plated on 0.1% (w/v) poly-L-lysine -coated 12-mm diameter coverslips at a density of 5 x 104 cells /each well in a 12 well plate; this is relatively low density to be able to view neuronal processes. Cells are cultured in Neurobasal medium, supplemented with 1x B-27 (it is ordered as 50x, but final is 1x 10 ml in 500 ml Neurobasal medium), 0.5 mM glutamine, 25 μM glutamate, and 5% FBS. 3 h after plating, the medium is replaced with serum-free Neurobasal supplemented with B-27 and 0.5 mM glutamine. Cultures typically contain few glial cells, start to form synapses after 6 days in vitro, and are typically used for synaptic studies 16 to 21 days after plating. The calcium phosphate (Jiang and Chen, 2006) method is used to transfect hippocampal neurons on DIV 4 or 5 with SynaptopHluorin with 1.5 µg DNA per well. Transfection efficiency is ~1-5% (see Figure 1). Transfection is performed at DIV 5. Neurons are imaged at DIV 16-21. The coverslips are mounted in the electric field stimulation chamber with vacuum grease (see Figure 2). 50 μl HBS is immediately added to cover the neurons and platinum wires. The seal should be sufficiently tight to prevent leaks. The chamber is perfused at a rate of 2 ml/min at room temperature with HBS solution with10 µM CNQX, 50 µM APV to prevent recurrent activity. All experiments are performed at room temperature but physiological temperatures can be used. Figure 2. Image of a recording chamber. Recording chamber with inserted coverslip A, and a diagram of orientation of a coverslip on a microscope B. Healthy SynaptopHluorin expressing-neurons are located using the excitation and emission filters for EGFP. Note: It is important to choose synapses that do not have very high levels of resting fluorescence because bright synapses tend to represent axons of unhealthy cells or cells highly overexpressing SynaptopHluorin molecules on the cell surface. Before stimulation, it is important to fix the exposure time and set up time-lapse image program on the computer. Exposure time should be long enough to have significant pixel intensity and short enough to limit significant photo bleaching. In our experiments, we use exposure times no longer than 100 ms.
Bleaching should be minimized so that there is no need to correct for bleaching during analysis. If bleaching is obvious, controls should be performed without stimulation to estimate bleaching rate to correct mathematically the final data for bleaching. At least three images must be obtained before stimulation to have sufficient data points to assure stable baseline fluorescence (Figure 3). The time course of fluorescent SynaptopHluorin responses is then obtained from time-lapse images taken every 3 sec (Figure 3). Following baseline imaging, neurons are stimulated with 100 stimuli at 5 Hz (50 mA, 1 ms pulses) for 20 sec (Figure 3). This should deplete the readily releasable pool and begin to use more slowly releasing pools. Brief stimuli work better for hippocampal neurons. We suggest starting at a low current pulse and gradually increasing the current until the optimum stimulus effect is obtained. Wait at least one minute before repeating stimuli since synapses need to recover after each stimulus. Also, mature neurons form the most complete synaptic connections so if there is little response it is helpful to use older cultures. In our experience, 16-21 day-old hippocampal neurons plated at a density 5 x 104 cells/a well of a 12 well plate are the best for the experiment. Another method to the check the maturity of the cells is to use fluo-4 AM calcium indicator. Neurons are loaded with 5 μM fluo-4AM (final) The stock should be prepared per manufacturers’ instructions and incubated at 37 °C for 30 min in the dark. 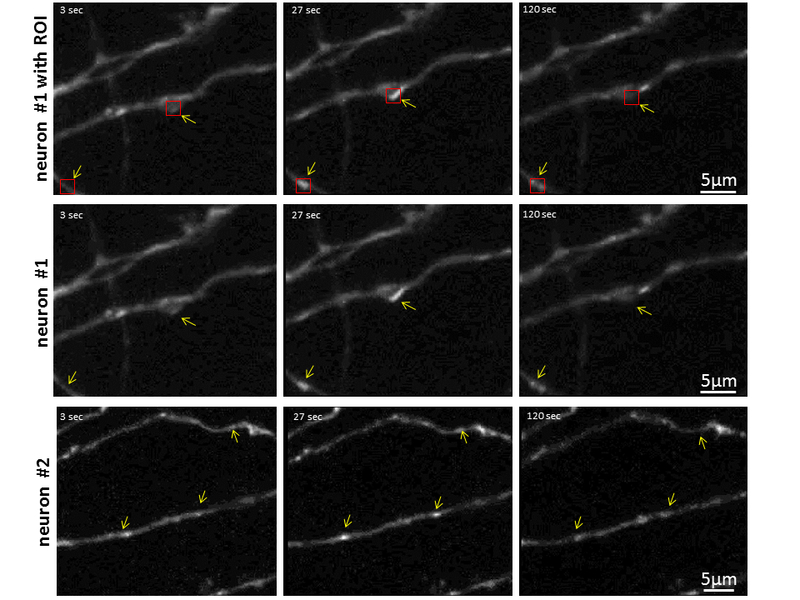 Fluorescent axonal varicosities correspond to synaptic boutons along hippocampal cell axons detected in phase images of the cultured neurons (Komai et al., 2006). Then neurons are stimulated (50 mA, 1 ms) at 5 Hz for 20 sec. The time course of fluorescent responses of indicator is measured from the time-lapse images taken every 3 sec. If the neurons have a robust response to fluo-4 AM, this predicts future success using SynaptopHluorin. During stimulation using SynaptopHluorin, images are obtained during the stimulus and after the stimulus for a total of 120 sec. After 5 min at rest neurons can be stimulated again at 5 Hz for 20 sec in the presence of 5 μM bafilomycin A1 in HBS. Neurons should sit at least 30 sec to allow bafilomycin A1 diffusion into the cell. After bafilomycin exposure, fluorescence will come to a plateau even after stimulation ends and this peak fluorescence value will be used as the absolute maximum of fluorescence intensity. Figure 3. Example plots of change in synaptopHluorin fluorescence over time. Images of fluorescent puncta were obtained for two cells (a control and a cell overexpressing Bcl-xL) that were stimulated with 100 stimuli at 5 Hz. 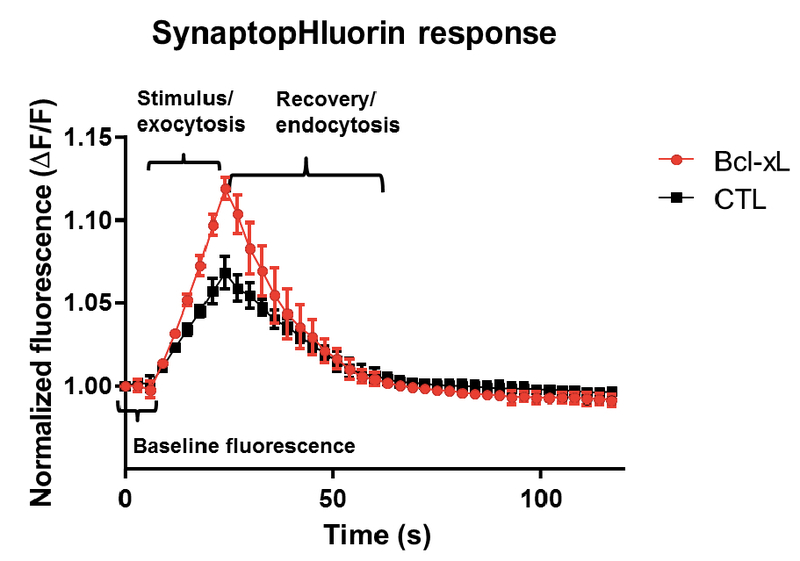 Shown are the change in fluorescence values relative to baseline for 5 sample synaptopHluorin puncta for each cell before, during and after stimulation. The time course of recovery to baseline can be measured by fitting curves to the recovery portion of the data. In General, an axon expressing SynaptopHluorin with high baseline fluorescence is not able to produce significant fluorescence increases upon stimulation. These neurons have an abnormally high surface expression of SynaptopHluorin; therefore one should avoid using these synapses. It is important to choose the right size regions of interest (ROIs). SynaptopHluorin diffuses within the plasma membrane of an axon away from the presynaptic bouton upon stimulation which increases the area of fluorescence (Li and Murthy, 2001). If the ROI is too small, it will not include this lateral movement, therefore you will not see the appropriate change in fluorescence. Because the average diameter of a bouton is about 1-2 µm and the lateral movement of SynaptopHlourin is an equal distance from a central point (Li and Murthy, 2001) we suggest the ideal size of an ROI for an individual bouton is about 4 µm2 (Granseth et al., 2006). The mean fluorescence signal of each ROI of a fixed size for all images is measured (see Figure 4). Image J can also be used for analysis. All fluorescent signals are background subtracted using an ROI off of the cell of similar size. Fluorescence values for baseline values are obtained by averaging 3 images at rest before the stimulus period. The time course of fluorescent responses of SynaptopHluorin are measured from time-lapse images taken every 3 sec. Images are analyzed using Axiovision LE software (or Image J) and Microsoft Excel. Fluorescence changes of puncta in response to a stimulus (∆F)=F-F0 (F=actual fluorescence of each ROI, F0: The initial fluorescence intensity which is the fluorescence before stimulus). Normalize fluorescence change of SynaptopHluorin puncta ∆F/F0 in order to see the differences before, during and after electrical stimulation. If the images move laterally during the time course, this will have to be corrected or the time course will not be accurate. The actual baseline fluorescence value varies in an individual synapse by about 10% between the first and second sets of stimuli. The absolute (non-normalized) resting (baseline) fluorescence may be measured from unquenched SynaptopHluorin molecules on the plasma membrane. The amount of unquenched SynaptopHluorin fluorescence may differ at any synapse, especially between different neurons. For this reason, measuring the absolute baseline fluorescence may better represent the actual data. These data should be shown in the published manuscript along with the normalized data. How do you prevent bias in selecting synapses? Do analysis randomly, make at least 3 different cultures (make the same standard culture each time), do control and experimental groups blinded to the experimental condition. Check all the images to make sure they did not move and are very stable. Do not choose bright synapses; set up the right size of the ROI and randomly choose boutons to do analysis. Try to average all records, the more analysis you do, the better representation of the average behavior of synapses and the less possibility of bias by a selection procedure. What kinds of artifacts do you see? Sometimes you see a change in fluorescence during the stimulation that does not recover after stimulation ceases. This may be caused by abnormally high surface expression of SynaptopHluorin or can occur in unhealthy cells. Some synapses never appear to respond. This may represent a bouton whose fluorescence sits below the detection threshold. There are different modes of vesicle retrieval whose relative prominence depends on the type of synapse. In our hippocampal images it was difficult to discern these different modes using SynaptopHluorin. SynaptopHluorin molecules are mobile and the lateral spread of fluorescence from the site of exocytosis to other parts of the bouton can cause artifacts in analysis. Investigators might want to consider using synaptophysin-pHluorin, which has lower mobility than SynaptopHluorin. In addition, interactions between closely apposed fluorescent puncta can perturb the fluorescence levels during stimulation. One should omit from analysis any puncta displaying these artifacts. Because SynaptopHluorin molecules are mobile, sometimes we can see that diffusion of SynaptopHluorin out of a small ROI causes a fast decline of the signal. This constitutes an artifact and is not related to endocytosis. To overcome it, choose a slightly larger ROI area to prevent significant diffusional loss of synaptopHluorin. The methods were adapted from (Li et al., 2013) Techniques were also adapted from all of the references cited. The authors wish to thank Miesenbock, G. (Miesenbock et al., 1998) for providing the synaptopHluorin construct for these studies. This work was supported by grant NIH NS064967 to EAJ. Beaudoin, G. M., 3rd, Lee, S. H., Singh, D., Yuan, Y., Ng, Y. G., Reichardt, L. F. and Arikkath, J. (2012). Culturing pyramidal neurons from the early postnatal mouse hippocampus and cortex. Nat Protoc 7(9): 1741-1754. Fernandez-Alfonso, T. and Ryan, T. A. (2006). The efficiency of the synaptic vesicle cycle at central nervous system synapses. Trends Cell Biol 16(8): 413-420. Granseth, B., Odermatt, B., Royle, S. J. and Lagnado, L. (2006). Clathrin-mediated endocytosis is the dominant mechanism of vesicle retrieval at hippocampal synapses. Neuron 51(6): 773-786. Jiang, M. and Chen, G. (2006). High Ca2+-phosphate transfection efficiency in low-density neuronal cultures. Nat Protoc 1(2): 695-700. Kaech, S. and Banker, G. (2006). Culturing hippocampal neurons. Nat Protoc 1(5): 2406-2415. Komai, S., Licznerski, P., Cetin, A., Waters, J., Denk, W., Brecht, M. and Osten, P. (2006). Postsynaptic excitability is necessary for strengthening of cortical sensory responses during experience-dependent development. Nat Neurosci 9(9): 1125-1133. Krueger, S. R., Kolar, A. and Fitzsimonds, R. M. (2003). The presynaptic release apparatus is functional in the absence of dendritic contact and highly mobile within isolated axons. Neuron 40(5): 945-957. Li, H., Alavian, K. N., Lazrove, E., Mehta, N., Jones, A., Zhang, P., Licznerski, P., Graham, M., Uo, T., Guo, J., Rahner, C., Duman, R. S., Morrison, R. S. and Jonas, E. A. (2013). A Bcl-xL-Drp1 complex regulates synaptic vesicle membrane dynamics during endocytosis. Nat Cell Biol 15(7): 773-785. Li, H., Chen, Y., Jones, A. F., Sanger, R. H., Collis, L. P., Flannery, R., McNay, E. C., Yu, T., Schwarzenbacher, R., Bossy, B., Bossy-Wetzel, E., Bennett, M. V., Pypaert, M., Hickman, J. A., Smith, P. J., Hardwick, J. M. and Jonas, E. A. (2008a). Bcl-xL induces Drp1-dependent synapse formation in cultured hippocampal neurons. Proc Natl Acad Sci U S A 105(6): 2169-2174. Li, H., Chen, Y., Jones, A. F., Sanger, R. H., Collis, L. P., Flannery, R., McNay, E. C., Yu, T., Schwarzenbacher, R., Bossy, B., Bossy-Wetzel, E., Bennett, M. V., Pypaert, M., Hickman, J. A., Smith, P. J., Hardwick, J. M. and Jonas, E. A. (2008b). Bcl-xL induces Drp1-dependent synapse formation in cultured hippocampal neurons. Proc Natl Acad Sci U S A 105(6): 2169-2174. Li, Z. and Murthy, V. N. (2001). Visualizing postendocytic traffic of synaptic vesicles at hippocampal synapses. Neuron 31(4): 593-605. Miesenbock, G., De Angelis, D. A. and Rothman, J. E. (1998). Visualizing secretion and synaptic transmission with pH-sensitive green fluorescent proteins. Nature 394(6689): 192-195. Park, H. A., Licznerski, P., Alavian, K. N., Shanabrough, M. and Jonas, E. A. (2014). Bcl-xL Is Necessary for Neurite Outgrowth in Hippocampal Neurons. Antioxid Redox Signal. Wienisch, M. and Klingauf, J. (2006). Vesicular proteins exocytosed and subsequently retrieved by compensatory endocytosis are nonidentical. Nat Neurosci 9(8): 1019-1027. How to cite: Li, H., Park, H. and Jonas, E. A. (2014). Fluorescent Measurement of Synaptic Activity Using SynaptopHluorin in Isolated Hippocampal Neurons. Bio-protocol 4(23): e1304. DOI: 10.21769/BioProtoc.1304.